Coin necklaces have been worn throughout history to bring luck and good fortune to the wearer. A unique silver or gold coin necklace is a timeless addition to your jewellery collection, they are perfect for everyday wear and are even thought to promote wealth and prosperity! We love the sentiment and meaning behind all coin jewellery designs. Ever since the 1600’s people have given coins to their loved ones as a meaningful gift. These “Love Tokens” were often engraved with sentimental messages and were either carried by the recipient for luck or adapted and worn as a meaningful coin necklace. During WW1 and WW2 soldiers sent unique silver and gold coin necklaces home to their wives, girlfriends, mothers and sisters. This became known as ‘sweetheart jewellery’ and reminds us just how sentimental and personal coin jewellery can be. Today, coin necklaces are a fashion staple for celebrities, influencers and bloggers alike. Back in 2011, coin jewellery and in particular coin necklaces rose in popularity when Holly Willoughby wore a double coin necklace on ITV’s This Morning show. Her coin necklace featured two 22ct Sovereign coins and was hand made in the UK. More recently, Kanye West designed a collection of jewellery in collaboration with Jacob Arabov (A.K.A. Jacob the Jeweler and the Founder of Jacob and Co.). The collection featured 12 coin necklaces and draws inspiration from 14th-century Florentine art. The collection of coin pendant necklaces are worn by Kim Kardashian and start from $1,530. Layer up your coin necklaces with a bead chain for extra impact! 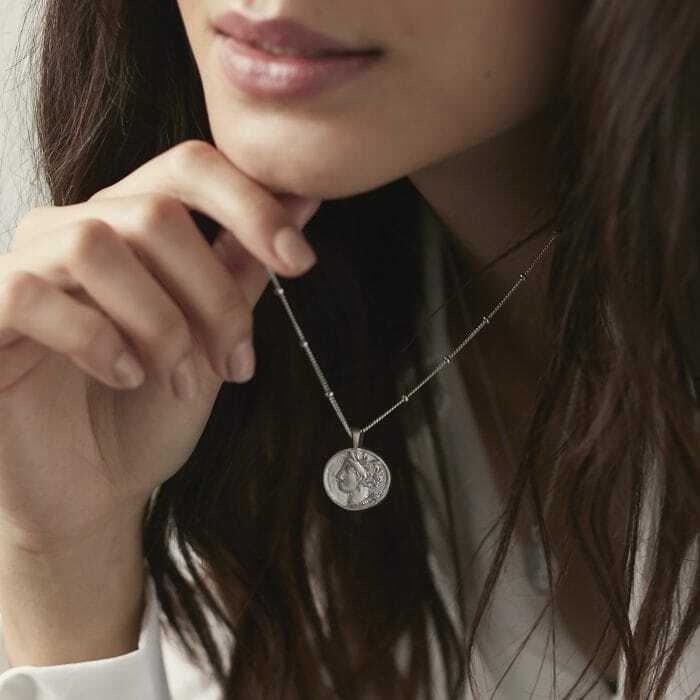 It’s all in the detail… Our Signature Ancient Coin necklace is a firm favourite of bloggers and celebrities alike! In the cold weather, layer your coin necklaces over knitwear to complete your look! A silver coin necklace makes the perfect wardrobe staple for everyday wear! The current trend for coin jewellery is towards hand made irregular coin pendants that have a vintage feel and a weathered texture. 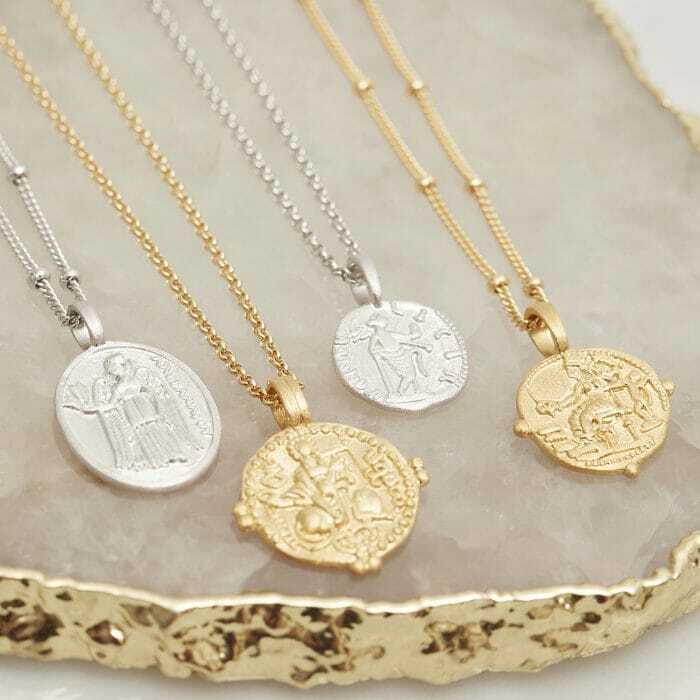 There is also a trend towards the ancient, with Greek coin necklaces and roman coin necklaces increasing in popularity as consumers look for more history and meaning in the jewellery that they wear for a modern heirloom feel. Coin necklaces are perfect for everyday wear, whether you’re adding detail to a casual t shirt and jeans or looking for the perfect necklace for a night out. The intricate coin detailing makes them a real talking point and a unique necklace design that holds real meaning. They can be worn alone or we like to wear layered coin necklaces to make a real style statement. During the colder months, we like to wear silver or gold coin necklace over our cosy chunky knits, as an effortless way to dress up any look. Whereas in summer we love layering coin necklaces with more talisman charms for a bohemian feel that is perfect for festivals and holidays! Why not try mixing silver and gold coin necklaces to create your own unique look. When layering, mix and match the chains on your silver and gold coin necklaces to create a look that’s true to your personal style. We love using beaded chains to give our look extra impact! Most coin pendants have a meaning behind them, Roman coin necklaces may depict the goddess Venus who represents love and beauty. Or an ancient Greek coin necklace could feature the goddess Athena for female empowerment or Aphrodite for love. Find a meaning that suits your personality to make it feel special to wear every day. The most popular coin necklace for men is the St. Christopher coin pendant, the patron saint of travellers. A single coin necklace makes a great go-to necklace for everyday and elevates any look. 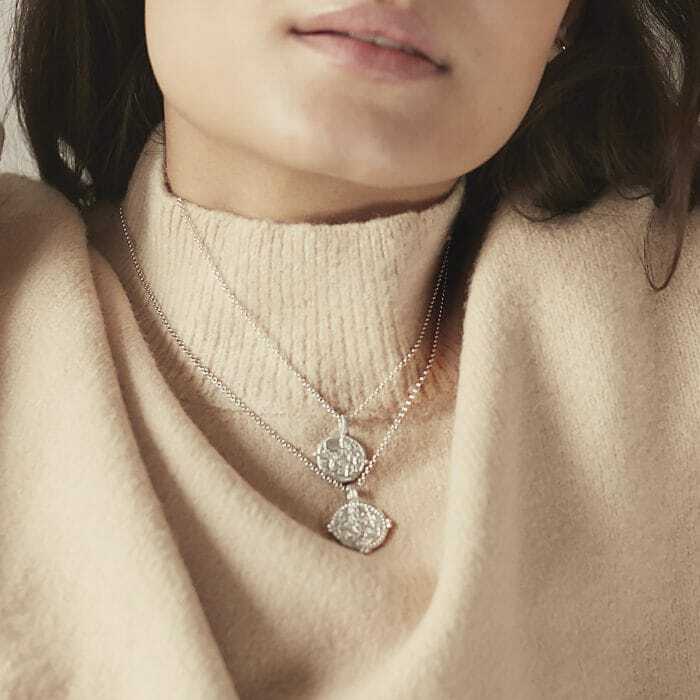 Whether you want to add to your look by adding more talisman necklaces or just wear your silver or gold coin necklace by itself, it’s a versatile piece of jewellery that will effortlessly enhance every outfit!